State lawmakers on Monday considered a host of recommendations to reshape and rename the Texas Railroad Commission, a powerful agency that oversees a host of oil and gas activities but not railroads. Staff of the Sunset Advisory Commission, the legislative body that periodically reviews state agencies, has called for big changes at the 125-year-old agency, including beefing up its oversight of drilling, pipeline safety and abandoned wells; improving record keeping; changing its name to the Texas Energy Resources Commission; and no longer regulating natural gas utilities. But as a hearing of lawmakers on the Sunset commission stretched into evening, it appeared unlikely that all of those recommendations would make it into legislation. One legislator said he believed the entire review was was unnecessary, and the criticism mean-spirited. "When I went through this report, I thought to myself, 'Why are you so angry at the Railroad Commission?'" Rep. Dan Flynn told Sunset commission staff. Though no lawmaker completely echoed Flynn, his spirited defense of the Railroad Commission underscored the difficulty of implementing change at the hulking agency in Texas, the nation's oil and gas king. Sunset Commission staffers said they did not intend to be mean. A few lawmakers backed individual recommendations, but the panel largely took aim at various suggestions — including the ideas of removing the commission’s authority to set natural gas utility rates and increasing the bond drillers pay to cover the plugging of thousands of abandoned wells. Several lawmakers echoed industry arguments that the Railroad Commission needs more money to plug abandoned wells, which can pose major threats to state groundwater, but that it shouldn’t come through increased industry bonds or fees. “I would hope we could devise a better solution than what’s proposed,” said Sen. Van Taylor, R-Plano. Meanwhile, the three elected leaders of the Railroad Commission pushed back against some of the recommendations and suggested that others — while potentially good ideas — would cost millions of dollars that the agency doesn’t currently have. Improving the agency’s tracking of enforcement, for instance, would require technology upgrades costing as much as $20 million, Commissioner Christi Craddick said. Scrutiny of the Railroad Commission, which depends largely on fees it collects from industry, comes amid a two-year downturn in oil patch that has chewed up agency revenues. These conditions have spurred the commissioners to ask lawmakers for more money. “We have an obligation to plug wells and remediate oil and gas sites,” Porter added. Monday’s hearing showed that the debate over the future of the commission — which has drawn fierce criticism from environmental and health advocates — is unlikely to be settled early in the coming legislative session. Environmental watchdogs and citizens grappling with nearby drilling largely backed the Sunset Commission's findings but called for even more changes at an agency they view it as too cozy with industry. 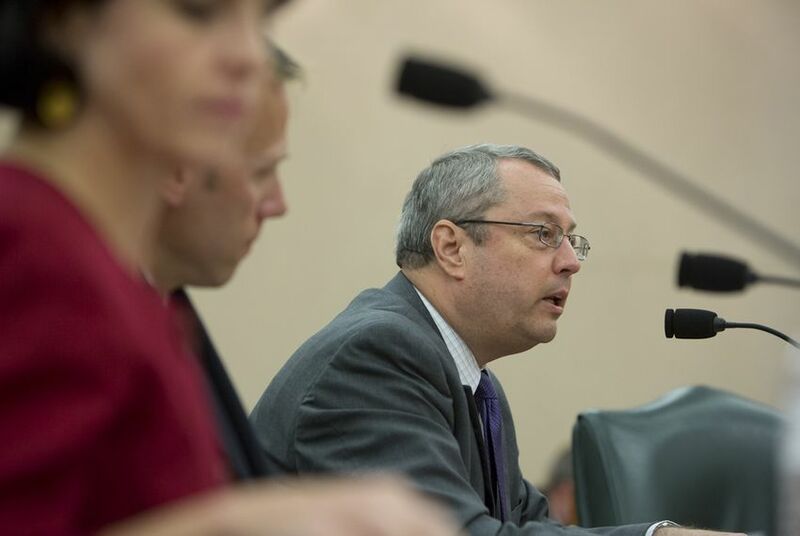 “The Texas Railroad Commission doesn’t do a good enough job, and we’re calling on Texas legislators to toughen up,” testified Tom “Smitty” Smith, director of the Texas office of the consumer group Public Citizen. The agency underwent the sunset process during the previous two legislative sessions, but it escaped a major overhaul each time when its three commissioners objected to reviewers’ proposals. In 2013, lawmakers rejected a wide range of Sunset Commission recommendations, including changing the commission’s name, shortening the period in which commissioners can fundraise, barring commissioners from accepting contributions from parties with business before the commission, expanding its recusal policy and requiring commissioners to resign before running for another office. The call to rename the Railroad Commission to reflect what it does — long a polarizing issue in Austin — drew less attention Monday that it has in the past. The Railroad Commission and industry groups suggest lawmakers should take up that issue in legislation outside of what the Sunset commission ultimately hashes out — so as not to threaten that proposal. The Texas Railroad Commission should beef up its oversight of oil and gas drilling, pipeline safety and abandoned wells and change its name to reflect what it actually does, the latest sunset review recommends. The Railroad Commission of Texas is set to go under intense legislative scrutiny next session after all, under an agreement by state House and Senate lawmakers. The agency won't get a six-year reprieve from that process – an earlier prospect that had rankled its critics. If state Rep. Larry Phillips gets his way, the Sunset Advisory Commission could be up for the sort of operational review it's used to dishing out to other state agencies — forcing the agency to justify its existence. Correction: A previous version of this story misidentified a lawmaker who was quoted criticizing a Sunset commission recommendation to increase bonding for abandoned oil wells. It was Sen. Van Taylor, not Sen. Larry Taylor.